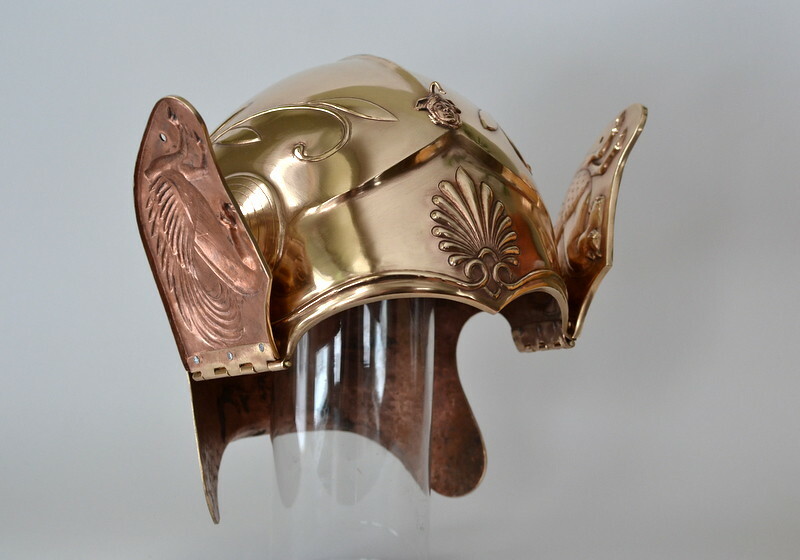 This is my most recently completed project - an Attic-Chalcidian helmet raised from a bronze cymbal. For those interested in the process of design and construction, I have described it in a post on my blog. I've heard of swords into plough shears and helms into pots but cymbal into helm is a new one to me. Great, concise description of the process too. Thank you. When/if you get the images of the helm with the crest attached, could you please post that too? I for one, would love to see it all kitted out. Excuse the pun, but hat's off to you for such fine work! Of course, I didn't use the cymbals because they were handy or cheap (they aren't), but because it is the closest match to the original alloy that I could find, and I haven't been able to source it as sheet. Beautiful looking jobs..esp seeing it's made of bronze. Finding anything made of bronze thee days is hard enough..finding source of sheet bronze even harder. 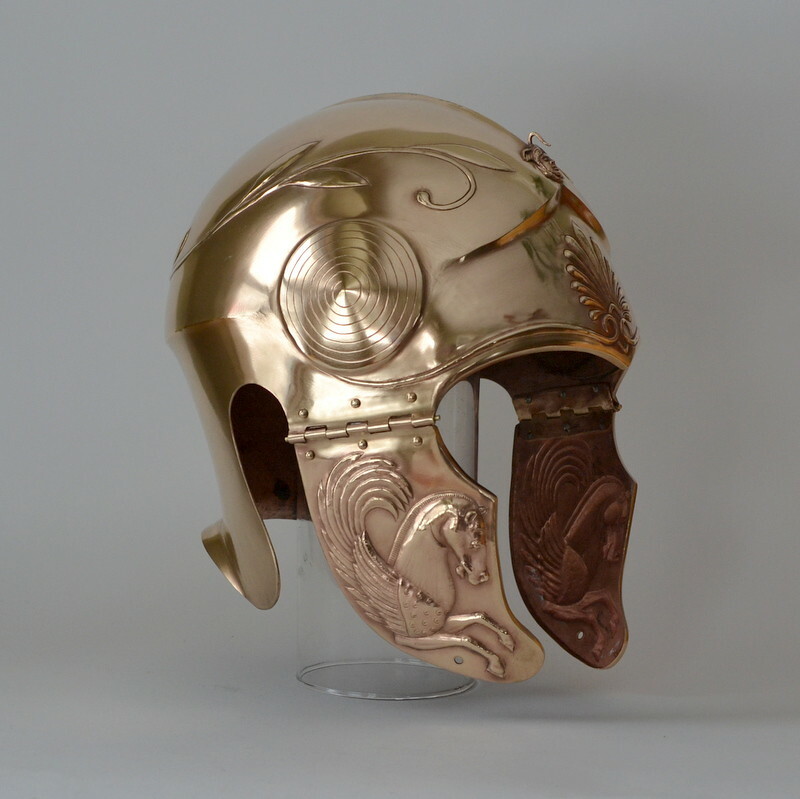 Does the helmet 'ring" when worn ? I haven't noticed much difference between the sound of a helmet made from cymbal bronze and other materials, but hammering all day hasn't exactly tuned my ear to such subtlety! A deep one-piece bowl of any hard metal will ring like a bell, but having the helmet lined and tight-fitting largely does away with it. Hinged cheek pieces go a long way to dampening vibration, too. Beautiful work as always Jeff. Do you prefer working with bronze more than steel or is it just whatever job at hand? Seems like quite a process to raise a helmet out of a cymbal. I enjoyed reading how you did it on your website. I think what prevents me from forming an attachment to any particular material is my preference for variety. I feel the same way about styles, time periods and cultures, too. Shifting from one to another as my projects allow keeps the work and the cultural context fresh. You made this helmet out of a cymbal, Jeffrey? How nice! Got to love the Pegasus engravings on the cheekpieces. To Tomas, it's swords into ploughshares, not plough shears.